Some divers are satisfied with being vacation divers, but if you want to do more diving and are tempted by the lifestyle, read on for tips on how to become a scuba instructor. 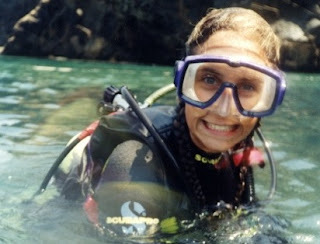 There are several different scuba diving organizations. PADI (Professional Association of Diving Instructors) is the largest and most well known internationally, but there are others, including BSAC (The British Sub Aqua Club), NAUI (National Association of Underwater Instructors), SDI (Scuba Diving International), TDI (Technical Diving International) and CMAS (Centre Mondiale des Activities Subaquatiques). Each system is just a different approach to diving. 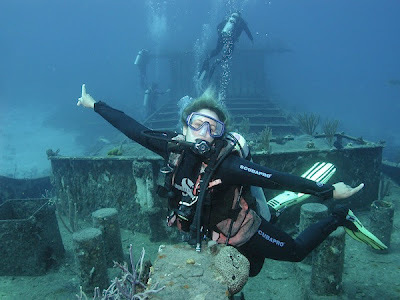 They each require divers to get recreational tickets before progressing through further courses and gaining more experience and becoming professionals. I am a PADI instructor, so my explanation will stick to that system. 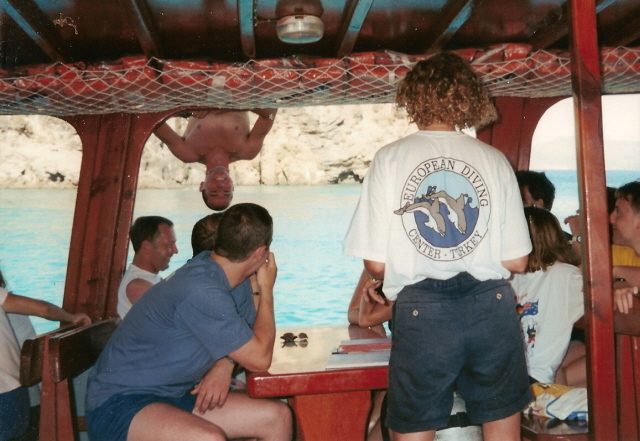 Scuba instructors sometimes face distractions! Before you can even think about becoming a scuba instructor you need to be extremely comfortable in water, including rough and cold water, all water essentially. This includes being able to swim. It sounds obvious, but if you are going to be responsible for other people in the water being a strong swimmer is imperative. You also need to have some diving experience. PADI insists on divers having a minimum of 50 logged dives to start a Divemaster course (those are dives deeper than 5 metres that lasted longer than 20 minutes). It doesn’t sound like much but there is a huge difference between the behaviour of a diver who has done 10 dives and one who has done 50. The recreational courses of Open Water, Advanced Open Water and Rescue Diver (which also includes a first aid qualification) need to be completed before you can approach the first professional level, which is the Divemaster course. The Open Water course teaches people to dive. Advanced Open Water furthers those diving skills. The Rescue Diver course teaches in-water rescue techniques. Divemaster is the first PADI professional level. 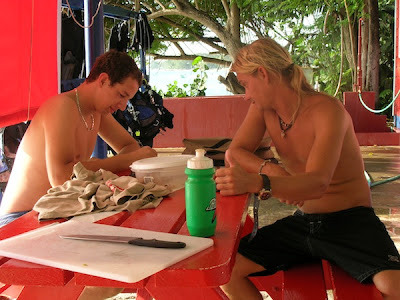 Divemasters are qualified to supervise divers and assist with teaching through the supervision of student divers. Divemasters cannot teach scuba diving. The knowledge jump from Rescue Diver to Divemaster is the largest. The Divemaster course covers, and students sit exams in the following eight subjects, physics, physiology, equipment, decompression theory and Recreational Dive Planner use, Dive skills and the environment, Divemaster-conducted programs, supervising certified and student divers. To become an Open Water Scuba Instructor, Divemasters need to complete an instructor development course, in which they are taught and then evaluated on their teaching techniques. They also need to complete further exams. Dive courses are often informal. Beyond becoming an OWSI there are other levels to go to. 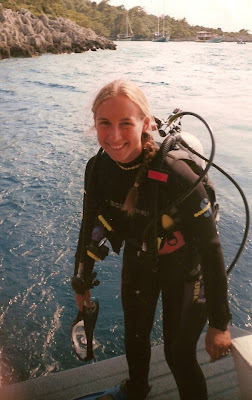 Once you have become a specialty instructor for five topics or more (wreck, boat, night, deep, altitude and nitrox diving, underwater photography, underwater videography and underwater fish identification for example) and completed over 25 certifications you can apply to be a Master Scuba Diving Trainer. And, beyond that you can become a Staff Instructor and ultimately a Course Director, and train other instructors. Costs vary around the world, but completing the mandatory five courses before you start your Instructor course and all the diving quickly adds up. 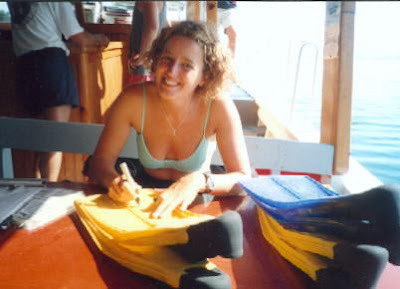 If the cost seems prohibitive ask dive centres if they offer Divemaster internships. Many do and internships are a good way of earning valuable experience while furthering your qualifications. Cylinders always need filling at dive centres. I found enormous satisfaction from teaching people to scuba dive. Sharing the fears of newbies, coaxing them through the courses and encouraging them on their first open water dives was all so rewarding, not to mention the sense of accomplishment that you can help another person to achieve. 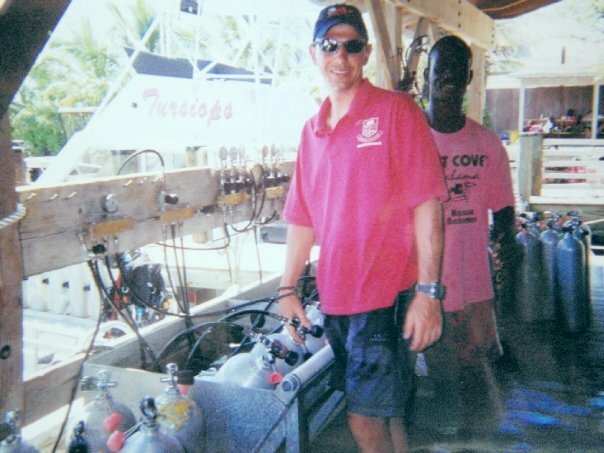 Of course you don’t need to be an instructor to enjoy working in the diving industry, I know a lot of very happy Divemasters who have never been tempted to teach. The instructor ticket is useful in obtaining work visas in some countries though. Has this information tempted you to train up and become a scuba instructor? I hope so because it is a wonderful life.